LP standard, LP-Shaped Guitar from Elypse Guitars. Replica of the Les Paul. 2 double pickups each with a volume knob and one tone. The handle is very cozy to play, but access to the latest box can be difficult because of the junction sleeve / body thick enough. This guitar is quite heavy (type LP ...) but it is fairly well balanced. Easily obtained a good sound in saturated or some guy. As against it is more difficult to obtain the highly crystalline, probably due to the dual microphones. The sound palette is still rather flexible (of course it also depends on the amp). This guitar suits my style of music that ranges from rock to metal alone. I play with a Roland Microtube, a pedal Behringer Behringer DR100 and another, the DM100. I get very good sounds with it all! I manage to get enough crystalline sounds through the amp on "Brit Combo". For other types of sounds, always adjusting to right to left, I can have a good range of sounds, from light crunch to heavy distortion very easily. The guitar does hardly breath, but the microphones are likely to "crunch" on their own if you put the volume knob on the bottom ... So I leave at about 7-8. The tone knobs are not very effective and I find that the guitar lacks a bit of sharp, even in position "trebble", but in my case, it does not matter for the sound I'm looking for . I use this guitar for almost a year. I started on electric guitar, but I was an amateur bass player for several years some time ago. So I still have some ideas that allowed me to choose this guitar over another (in the range of prices). 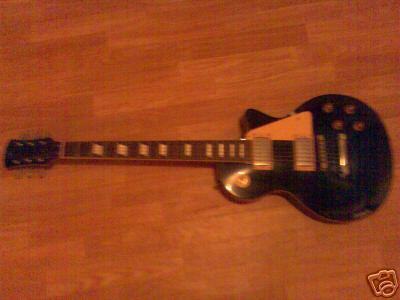 I like the LP form, the color of the guitar is black with cream accessories. I think this guitar at a good price / quality ratio. This would perhaps be interresting to compare it with an Epiphone entry level ..
With experience, the moment I do not regret my choice.